The trio of singing siblings from Highland, NY, Michael, Avery and Nadia Cole - the Voices of Glory - who took fifth place on “America’s Got Talent” performed at Madison Square Garden in New York City on Monday, January 18, 2010 as part of the Rev. Dr. Martin Luther King celebration as the New York Knicks took on the Detroit Pistons. The trio of singing siblings from Highland, NY, Michael, Avery and Nadia Cole - the Voices of Glory - who took fifth place on “America’s Got Talent” performed at Madison Square Garden in New York City on Monday, January 18, 2010 as part of the Rev. 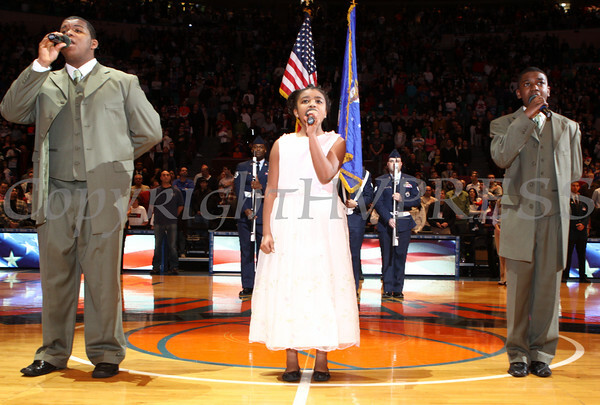 Dr. Martin Luther King celebration as the New York Knicks took on the Detroit Pistons. Hudson Valley Press/CHUCK STEWART, JR.